Audiences make important decisions about you in the first 30-60 seconds. Here's how to begin any presentation successfully! Do you know how long it takes to get an audience on your side? It's not very long. In fact, audiences make decisions about your credibility, believability, and likability within the first 30-60 seconds. If you're visible before you speak—if, say, you're sitting on stage waiting to be introduced, or greeting audience members beforehand—these decisions start even earlier. More than anything else at that stage, it's your physical presence that audience members are responding to. And we all know that impressions based on body language can be powerful. Body language is a powerful tool for boosting your ability to engage and persuade audiences. Learn how to leave a lasting impression that leads listeners to action. 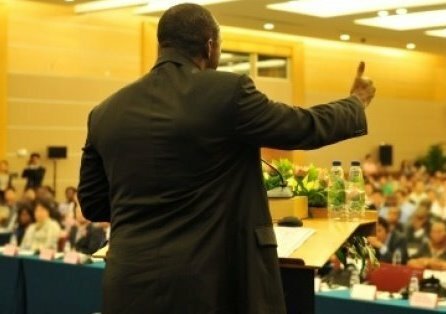 Download my free guide, "The Body Language Rules: 12 Ways to Be a More Powerful Speaker." So you have to be using body language effectively right from the start. That means relating to your audience well. And that in turn means using appropriate eye contact, and otherwise acknowledging your listeners' presence in physical terms. Have you ever listened to speakers who kept their gaze glued to their notes even as they began their speech, using the dull-as-dishwasher opening: "Good evening, ladies and gentlemen. Tonight I'm going to talk about . . ."
Why in the world would anyone do this? Presumably, these speakers understand that there are human beings in front of them, ready to receive whatever they're going to say. So why aren't they looking at them? Presumably, they don't need their note cards to announce their name or their topic! Here, instead, is how to give your audience a greeting they'll remember. Here's a general rule to bear in mind: When you're looking down at your notes, nothing should be coming out of your mouth. Learn how to look down and "grab" key phrases and sentences, then look back at your listeners to say them. Even more important, look at your audience and acknowledge them before you get into the body of your speech. If you've practiced sufficiently, you shouldn't need to look at your notes much even then. But you certainly can't afford to bury your attention in your written material when you first present yourself to an audience. To really wow listeners, combine your newly strong attention on your audience with one of these 12 foolproof ways to open a speech. Remember those critical first sixty seconds! Want to launch your speeches with maximum impact? Learn proven techniques for influencing listeners from your first word to your last. 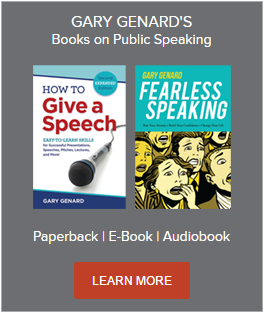 Get the e-book for powerful openings and closings, "How to Start a Speech." What does the above accomplish? Instead of gluing your attention to your notes, you'll be establishing a communication bond between you and your listeners. Think of it as an electric arc crackling between you and them. Put more simply, it's just a case of your focusing on them rather than your manuscript or anything else in the room. And it works if you're talking to one person or thousands. Relating to an audience this way allows them to feel that you are talking to them as individuals. It also makes you accessible. That can matter later during the Q & A, when people need to feel they can safely ask you a question when all eyes are on them. If you're someone who's been showing them that they're the ones who matter, it's much easier for every audience member to feel they have a relationship with you. 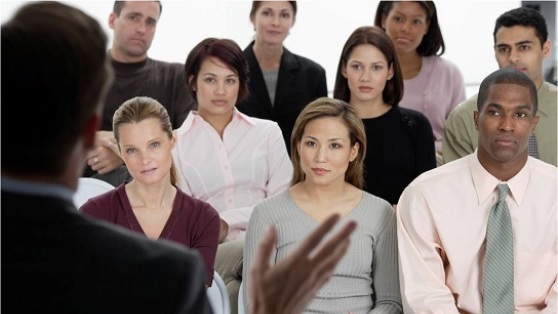 Incidentally, here are 4 reasons Q & A is a presentation tool you need to master. Speakers who come across as distant don't invite such responses; but you, on the other hand, should give your audience that chance. If you're not looking at them, they won't feel that any real communication is occurring. And they'll be less likely to respond to you in other ways. One other thing concerning eye contact. When you look at audience members, be sure to let your gaze linger long enough so that real contact is made. One or two seconds is probably enough time. And remember to smile! 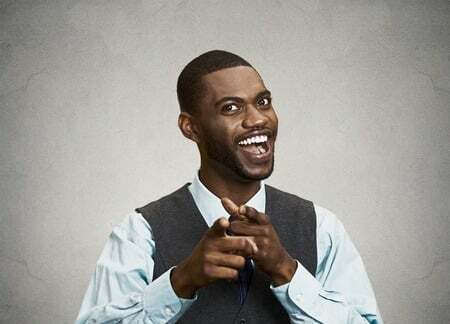 You'll remind everyone present that this speaking event is an enjoyable situation. I remember a person I trained who had a habit—it's a common one—of allowing her gaze to "flick" from person to person, as though she were flinging her gaze at them. She'd probably been told to use eye contact but had never been coached in doing so correctly. Audience members on the receiving end of that habit would never feel that she was truly looking at them. I asked her to try a simple exercise. She was to look down at her notes and absorb what she wanted to say, without any concern for how much time she took to do so. Only then could she could look up and speak to the group. She followed these directions, and the effect was dramatic. As soon as she took her time in sharing what she wanted to say, she immediately become a more credible—and much more human—speaker. Audiences make critical decisions about you in the first 30-60 seconds. Your body language and eye contact are important elements of credibility. When you're looking at your notes, nothing should come out of your mouth. Establish a communication bond with listeners and you'll more easily persuade. Allow your gaze to linger on people long enough so true contact is made. This blog was originally published in 2013. It is regularly updated.